You can't look at the news at the moment without seeing the name ISIS. But in Syria it isn't just these brutal terrorists that are causing death and destruction, the Syrian government itself is still responsible for many civilian casualties. With populated areas constantly under attack by "barrel bombs"—nasty oil drums full of explosives and chemical weapons that are dropped by the regime—Syria has become the most dangerous place in the world to live. Helping to bring attention back to the plight of the ordinary people of Syria is this short film In Reverse commissioned by The Syria Campaign and directed by Martin Stirling, who previously directed Most Shocking Second A Day Video for SaveTheChildren. The powerful film shows a bomb attack on a school playground but shot in reverse, starting with the aftermath of the destruction before pulling back to show its cause. It's a touching and pertinent reminder that lives, many of those young children, are still being lost on a daily basis. Show your support to the people of Syria by signing the #withSyria petition. 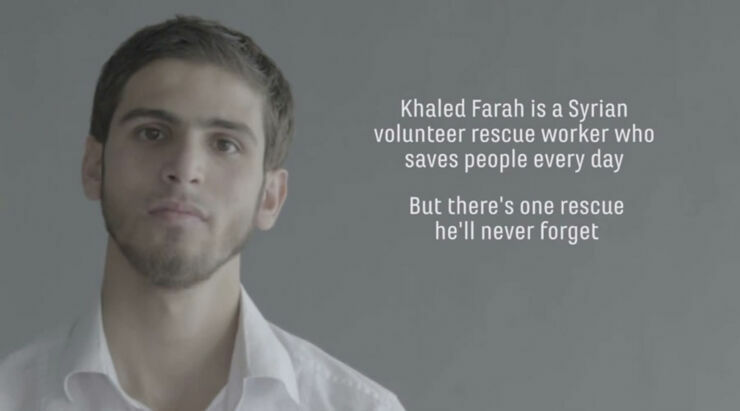 You can watch and read about The Syria Campaign's previous film, exploring the volunteer heroes active in Syria, below. Syria has been immersed in a Civil War since 2011 and it's had a devastating effect on the civilian population. But, amongst the devastation and the horror, there is hope in the form of a group of volunteers known as White Helmets. In the video above one of their members, Khaled Farah, talks about the moment he and his colleagues found a baby alive but buried beneath the rubble of an explosion. The moment in the video where the dust-covered baby is pulled from the wreckage is both heartwarming and upsetting. This isn't just an isolated incident either—risking their lives the White Helmets make it their job to search bomb rubble for signs of life and have saved 2,514 lives in the past year alone, according to Whitehelmets.org. Tragically, the White Helmets aren't receiving the funding they need to buy equipment and medical supplies to aide them in their work. A petition has been launched to ask donor governments to release funds to this organisation so they can get much needed tools and supplies. You can sign the petition here.